Fig. 11.5-11. Transverse section of tomato stem (Lycopersicum esculentum). 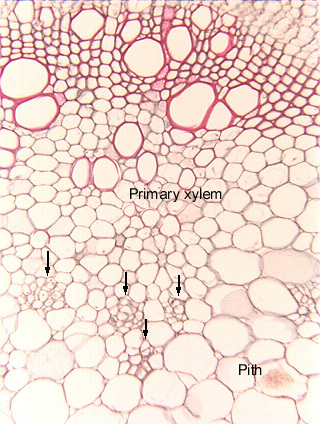 This species has internal phloem (arrows): phloem that is located to the inside of the primary xylem, in the pith. 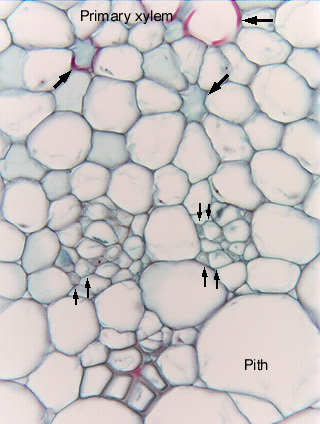 (Be careful of the name: this is internal phloem; in an unusual type of secondary growth, phloem is located inside the wood, the secondary xylem; that phloem is included phloem.) This is a bicollateral vascular bundle because there is phloem to both the outside and inside of the xylem. The high magnification micrograph shows the internal phloem in greater detail, and pairs of arrows mark pairs of sieve tube members and companion cells. Notice how extremely narrow these cells are. The three large arrows indicate torn protoxylem vessel elements; the lowest of the three appears to be just a ring of parenchyma cells surrounding a lumen, and it would be easy to mistake it for a secretory duct with an epithelium. But by examining other sections, you would eventually find fragments of the vessel’s secondary wall.